A Gandharva Marriage (Sanskrit: गन्धर्व विवाह, pronounced gənd̪ʱərvə vɪvaːhə) is one of the eight classical types of Hindu marriage. This ancient marriage tradition from the Indian subcontinent was based on mutual attraction between two people, with no rituals, witnesses or family participation. The marriage of Dushyanta and Shakuntala was a historically celebrated example of this class of marriage. Dushyant & Shakuntala in the Hindu epic Mahabharata. The son that resulted from their Gandharva marriage was named Bharata. The Smritis of Hinduism recognize eight methods of marriage, one of them being Gandharva marriage. 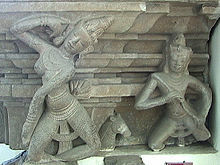 The other seven are: Brahma, Daiva, Arsa, Prajapatya, Asura, Raksasa and Paisacha. Gandharva marriage is, according to Apastamba Grhyasutra – an ancient Hindu literature, the method of marriage where the woman selects her own husband. They meet each other of their own accord, consensually agree to live together, and their relationship is consummated in copulation born of passion. This form of marriage did not require consent of parents or anyone else. According to Vedic texts, this is one of earliest and common form of marriage in Rig Vedic times. promptly obtain happiness through a husband. not at odds with her husband! to bring hither to this woman the suitor who shall be agreeable to thee. bend his mind towards her. Turn thou the attention of every agreeable suitor to her. In modern India, particularly in urban regions, gandharva marriages are re-emerging. These self-arranged marriages in India are now called love marriages. Most of these, however, do involve some form of ceremony where friends and members of family are present. A 2006 article reported that between 10 and 20 percent of marriages in urban India were love marriages.